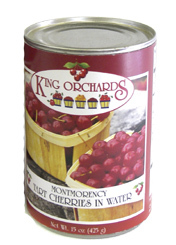 Welcome to our King Orchards Mi-Cherries website, where you will find information about our Montmorency tart cherry products and our family fruit farm here in Northern Michigan. 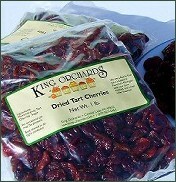 Please note: We have moved our online store and shopping cart to our main farm website, KingOrchards.Com. We hope you like the new shopping experience and find it easier to navigate. 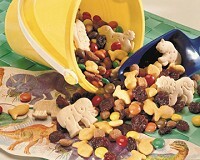 Please don't hesitate to contact us if you have any questions or trouble placing an order. 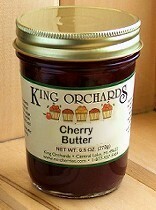 We also invite you to join the discussion at our new King Orchards blog, where you'll find orchard reports, farm market updates, recipes and cherry news. We'd love to get your comments and feedback. View photos of life on the farm. Read more about our family farm. Know your Farmer, Know your Food - See John King and King Orchards' "We are Michigan" video profile at the Detroit Free Press. 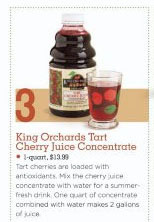 King Orchards Tart Cherry Juice Concentrate was selected by Heart-Healthy Living Magazine as one of 9 "New for You" heart-healthy products for Summer 2007. We are a first generation family farm. 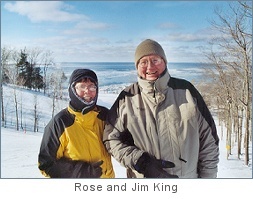 John and Betsy along with Jim and Rose King and the children make up the family. Our fruit stands and orchards are located at US-31 and Creswell Road in Kewadin (9 miles north of Elk Rapids) and 3 miles east of US-31 on M-88 (near the town of Central Lake, Michigan). We love the farming life and work hard to grow quality fruit. 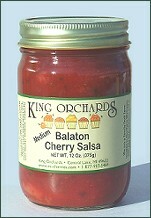 In addition to 130 acres of tart pie cherries, we grow 10 acres of Balaton cherries (a new tart cherry variety from Hungary), 32 acres of sweet black cherries; 95 acres of apples, including 20 acres of staked high-density plantings; 10 acres of peaches; 3 acres of pears; 2 acres of apricots; 12 acres of sweet corn; and 2 acres of garden vegetables (if we can keep Rose reigned in). The orchard is situated on the highest ground in Antrim County. Looking west we can see Torch Lake, about 3 miles away, and Grand Traverse Bay and the Leelanau peninsula beyond that. The rolling hills and ridges here were formed by the glaciers and are called drumlins. They help to allow good cold air drainage, which is important to prevent frost damage. Our proximity to Lake Michigan's Grand Traverse Bay keeps the temperatures moderated in the spring and fall. Many people feel that the best fruit in the world is grown here in northwestern Michigan. Dried tart cherries mixed with cashews, smoked almonds or honey roasted peanuts make a great snack or appetizer for family or unexpected guests. There are many delicious ways to choose tart cherries for a year-round addition to your healthy diet. 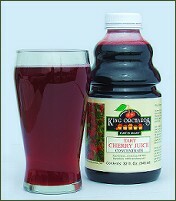 There are many different types of cherries. 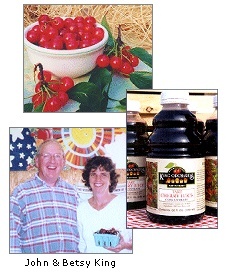 In "How to get cherries", we describe the numerous varieties, and all of the ways to buy them. 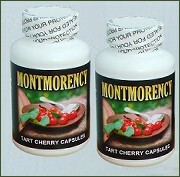 King Orchards Montmorency Tart Cherry Products.